Bonus, Level 3 A random number of ammo and multiplier is chosen 4 times. try to reach the end of the bar to kill the queen and collect 240 times bet, get credits for certain points on the bar. 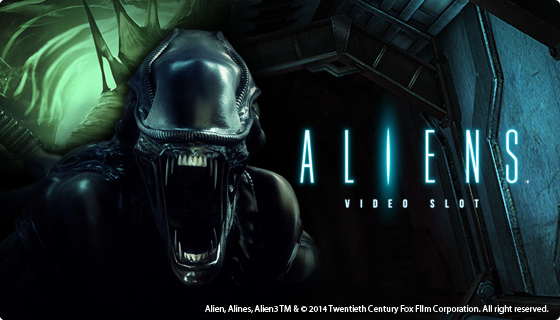 Aliens is a branded video slot by NetEnt that uses the famous 1986 movie as main theme. This slot feels very much like the movie, dark, creepy and scary. The graphics and sounds are amazing and Aliens comes with a very unique 3-level bonus game. You start level 1 during normal play. Each winning combination will add multipliers to those symbols and also fills a progress bar on top. Fill this bar to enter level 2. During level 2 you start out with 1 ammunition and get a winning spin starting with the lowest paying symbol. After the spin you shoot an alien and try to collect more ammunition (random). You keep receiving winnings spins as long as you have ammunition and don’t die. The symbols will become higher and higher. If you reach the end of this level you will enter level 3. Level 3 has the main goal to destroy the queen. You get 5 chances where you collect ammunition and multipliers. Try to collect as many as possible to reach the end and destroy the queen. This will award and extra 240 times bet on top of what you already won during level 2 and 3. Aliens is really an amazing video slot and might seem very confusing, but once you play it, you will understand how it works. Aliens also comes with a NetEnt Touch version for mobile devices.